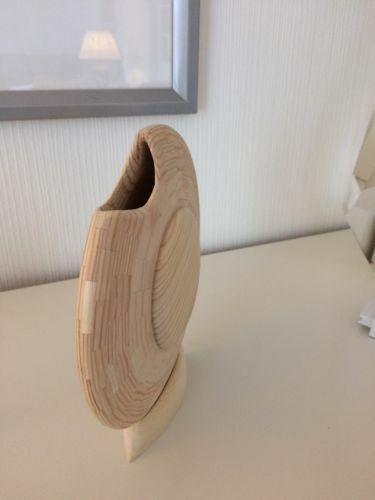 I turned some narrow disk shaped weed vases from solid birch quite a few years ago. Early last year I decided to do some segmented turning again after a lapse of a few years and I thought it might be fun to try a segmented version of those disk shaped vases I had made before, but only out of pine since this wasn’t a keeper, and no finish was applied. I didn’t have my wedgie sled built yet to cut the segments on the my table saw so I had to use my band saw instead with an improvised wedgie sled. I set the fence angles with my digital square. 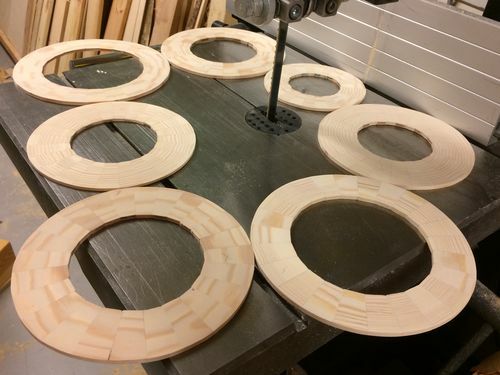 I cut 7 rings with 24 segments each. 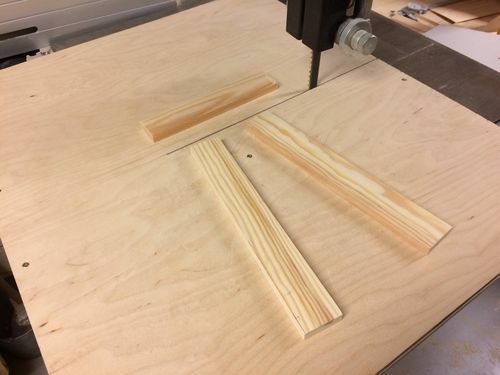 I was surprised how good the glue joints were using a bandsaw. 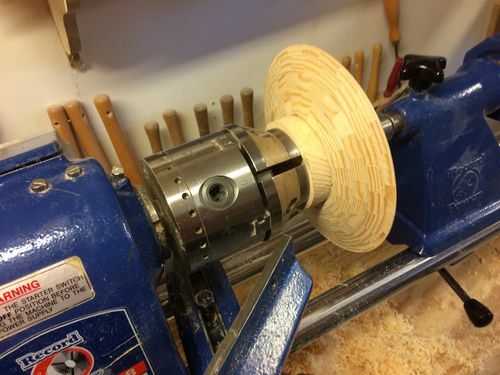 Here it is with the rings glued together and mounted on my lathe. As you can see, it has a very thin profile, maybe a little thinner than I had planned, but no worry, it was just an experiment anyway. And finally the results after I carved an opening for the weeds and made a little stand for it to sit on. I don’t like this type of shape with a flat bottom as most of them are, but I have to admit that the stand has somewhat the same effect, so I guess it’s in the category of a personal preference and not necessarily better. I guess I should have had the opening more towards the top, but these are old photos, so I just had to use what I had. One interesting thing is that I took these last two photos with my mobil phone in a vertical position and as most of us know by now, they always post sideways on LJ. I was able to overcome that to have the photos post right side up by taking screen shots of them and then selecting the screen shots instead of from my photo library. If you have any ideas about how to improve this design please let me know and I don’t mind negative remarks either. 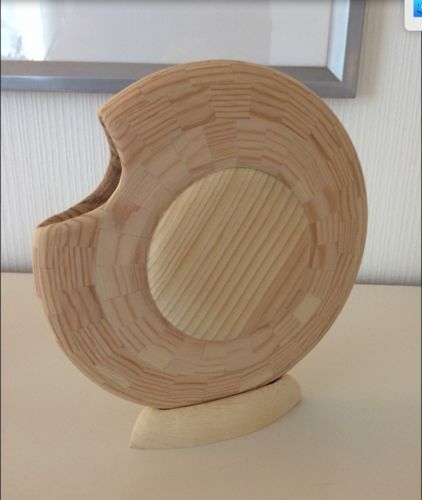 I have thought that the center piece could be an opportunity for some creative woodcarving, but of course using a wood without such a strong grain pattern as the pine used here. Huh, that is much nicer than I expected. I like it. And pretty impressive glue joint with the bandsaw. Neat. Mike you’re a great innovator very cool Idea and well done, you even overcame the dastardly upside down photo syndrome. Thanks Steve and Jim. I’m probably more proud of the photo fix than the turning. We always learn more when disaster strikes! You make the coolest stuff! Thanks Paul.I should have added that the center piece on this design would also lend itself to marquetry, and I may do one like that in the future if I can figure out an appropriate motif. I have a project in the works that I hope will be a lot more interesting than this one, providing it turns out well enough to post! At my current rate it will probably be May before it’s finished. Maybe a few days work for a real woodworker. Well Mike, I can only agree with the above comments, some very clever and fascinating work you have done. Amazing what one can make when there is no pressure to perform to specific schedules and specifications. Just out of interest just exactly what sort of ”Weed” did you have in mind to grow in them? Standing by for a possible May update. Mike, that is one of the more intriguing turning designs on LJ. Looks like a Top 3 in projects to me. 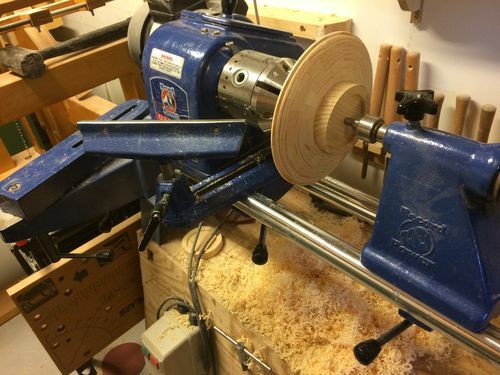 Very interesting turning. I would like to learn more about the wedgie sled”. Beautiful result Mike. Thanks for posting your process. That is just SUPER COOL! Mike, Pretty nifty turning. Tell me again why this is not a keeper? Considering you were just tinkering around and didn’t intend to make a “keeper” it sure turned out well. I was expecting to see a shallow platter as a finished product. This reminds me of a seashell. Very ingenious approach. Another reminder why I need to get a lathe. I’m really surprised at the positive response to this design and I do appreciate the nice comments. I guess I will have to make a good one in the near future to post as a project . Rob Weed Pots are for dried weeds that are decorative. The usually have small round openings at the top. Flowers would overpower the these containers, which are often pretty small, so a wispy weed or cattail is usually more appropriate. Ken Not a keeper because the pine grain is too strong. The ones I did in the past from solid birch were much nicer and I did some carving on them to give them a sculptured appearance. I also make a much nicer stand for them and they were dyed and finished with a hand rubbed lacquer. The opening at the top was also smaller and shaped much nicer. Unfortunately this was pre-LJ days and I don’t have any photos of them and they are long gone now. These videos demonstrates the use of the wedgie sled by Jerry Bennet, it’s inventor. The 2nd video shows you how to build one. The wedgie sled was a great innovation and insures perfect segments every time (providing your stock is properly prepared and you use the sled correctly and orient the segments properly).